Ottawa – Mayor Jim Watson, Transportation Committee Chair Keith Egli, Environment and Climate Protection Committee Chair David Chernushenko, Hydro Ottawa President and Chief Executive Officer Bryce Conrad, and Chief Energy and Infrastructure Services Officer for Envari, Adnan Khokhar, shed some light on the City’s efforts to convert its 58,000 street lights from high-pressure sodium and metal halide to light emitting diode (LED) technology. The City is working on the conversion in partnership with Envari (formerly known as Energy Ottawa) who will continue to help to convert the remaining street lights to LED technology. As new roads are built in the future, they will also be equipped with LED lighting. Envari is an affiliate of Hydro Ottawa, the City’s power supplier. Envari has the detailed technical knowledge, experience and project management expertise required to assist with the LED conversion project. LED street lights have lower maintenance costs, offer greater light control, reduce light pollution, and allow staff to more easily monitor problems and even receive automatic notifications in case of failure. Extensive improvements in efficiency, output, and costs of LED over the last few years have made the technology an attractive replacement to existing equipment. 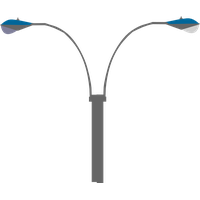 Switching to LED technology is allowing the City to reduce its energy consumption used for streetlighting by more than 60 percent, generating annual savings of approximately $4 million. In addition, the City expects to reduce maintenance costs for street lights by 50 percent, an extra $2 million in savings each year. Conversion of the remaining street lights is expected to be completed in 2020. A pilot project on Carling Avenue saw 750 lights converted to LED technology. The pilot has saved the City $72,464 annually.